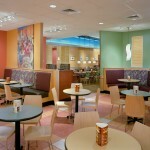 Today’s gift: an unexpected Three Musketeers Dinner (me, J and M) at Panera. The three of us had a delightful dinner — and dessert too — at a local Panera. Spontaneous and last-minute!? Somehow, without planning and without advance notice, M was able to go with the flow. And J always likes restaurants. Sure the food ratings, decor and service didn’t meet the Zagat Guide Standards, but even ratings in the 20s couldn’t have made our impromptu dinner more fabulous. And, as M will tell you, Panera bakes a mean shortbread cookie. This entry was posted on Monday, March 28th, 2011 at 8:58 pm	and is filed under Blog Posts. You can follow any responses to this entry through the RSS 2.0 feed. You can leave a response, or trackback from your own site.